July 26, 2011 by Ken Ward Jr.
It’s certainly no secret that Sen. Joe Manchin is a major “friend of coal,” but now his personal financial ties to the industry are under scrutiny by the national media. Sen. Joe Manchin (D-W.Va.) is more than just a supporter of his state’s influential coal producers — he’s a full-fledged industry insider. On his financial disclosures for 2009 and 2010, Manchin reported significant earnings from Enersystems Inc., a coal brokerage that he helped run before his political star rose. In the 19 months before winning his Senate seat in a hard-fought special election, Manchin reported operating income of $1,363,916 from Enersystems. His next disclosure showed $417,255 in Enersystems income. The story notes that Manchin’s financial ties to the industry are an “open secret among coal critics in his home state.” It doesn’t mention that Enersystems has been an issue before in his political campaigns. 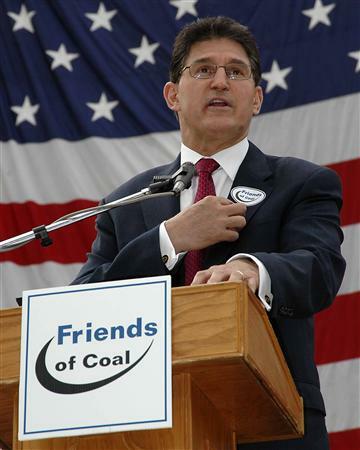 In 2004, for example, the Lloyd Jackson gubernatorial campaign tried unsuccessfully to link Manchin to non-union coal sales (subscription required) and the controversy over those allegations actually dates back to the mid-1990s, (subscription required) when Manchin was a state senator running for governor. Manchin’s office did not provide many details about the senator’s ties to the company in response to a series of specific questions. Public records and media reports show that he handed day-to-day control of Enersystems to his son after being elected West Virginia secretary of State in 2000 and moved his company holdings into a blind trust between 2005 and 2010, while he served as governor. Manchin’s Enersystems holdings and other in-state assets are being transferred to a new blind trust that complies with federal rules, a source indicated to E&E Daily. The prospect that Manchin’s $1.7 million-plus in recent Enersystems earnings might tilt him even more strongly pro-coal might seem remote, given the deep economic and cultural connections that the industry maintains in West Virginia. In addition, the income from his family-owned energy brokerage violates no Senate ethics rules — thanks to a conflict-of-interest standard drawn broadly enough to prompt howls of dismay from some watchdogs in recent years. As congressional ethics expert Stan Brand explained it, no amount of outside income would be enough on its face to force a senator to step aside on issues in which he had a personal stake. “The presumption is, you shouldn’t recuse yourself from voting unless your conflict is direct and different from a class of people who share the same interest,” Brand, a former House counsel now in private practice, said in an interview. Citizens for Responsibility and Ethics in Washington executive director Melanie Sloan, a former federal prosecutor and congressional counsel, cited the case of ex-Sen. Lauch Faircloth (R-N.C.). A hog farmer, he sought and won Ethics Committee approval to maintain his financial interests in the industry while voting and using his seat to press for the extension of subsidies to domestic pork producers. Blind trust – so Joe has his “hands off,” yet he knows full well that he continues to reap generous financial gain because of the coal industry and his advocacy of it. In other words, coal is still making him rich. Only in the U. S. Senate would this NOT be considered a conflict of interest. I don’t see this as a problem. How many of those liberal people in congress own shares of green energy products? Same thing. The bottom line is that at the same time Manchin was arguing, presumably on the merits, the value of an expanded coal industry to this state, he was making a million bucks in one year directly from his personal ownership in the industry, a fact not broadly known til now. At the same time he was telling the citizenry how great the coal industry was for the state, 57% of the children of McDowell county were receiving food stamps and 42% of Mingo children did also. Wyoming county? 43%. How good was coal to these children in the heart of coal country? Was coal their friend? Yes, you say? Well, with those kinds of friends, they clearly need no enemy. It is a sad fact that these children live in such poverty. I am from these areas and know that many people could work if they wanted to. Fact is they don’t want to. Very Sad that the children have to pay. It is not the responsibility of the coal industry to support these children. It is not a socialist or communist community. Name one other industry that supports all of the community. If it wasn’t for the coal industry I assure you, those numbers would be much higher. Your right I can’t name an industry that takes care of all of society. I can, however, name thousands of industries that exploit the local population in the name of profit, and coal in WV has traditionally been one of the best at this in the US. You know Matewan et al. Coalfire, I’m from McDowell County. It is poor because the coal industry owns all the land, has laid off most of its workers, and won’t allow any other industry to come in. And who would want to, after the coal industry has torn it apart, and pays few taxes to support any infrastructure. Coal has killed southern West Virginia. I’m from Wyoming and my mother is from McDowell. Actually most of the land in McDowell is owned by a land company. Most is owned by Pocahontas land. If it wasn’t for Coal in the first place McDowell wouldn’t even be a dot on the map. Yes the large mines shut down and left basically a ghost town. How is this any different than the auto industry in Detroit? Most of Southern WV can’t support other manufacturing industries. No roads or flat land to develope. It is a sad fact. I want other industries to come in but, I don’t want to sacrafice what we have until those do.